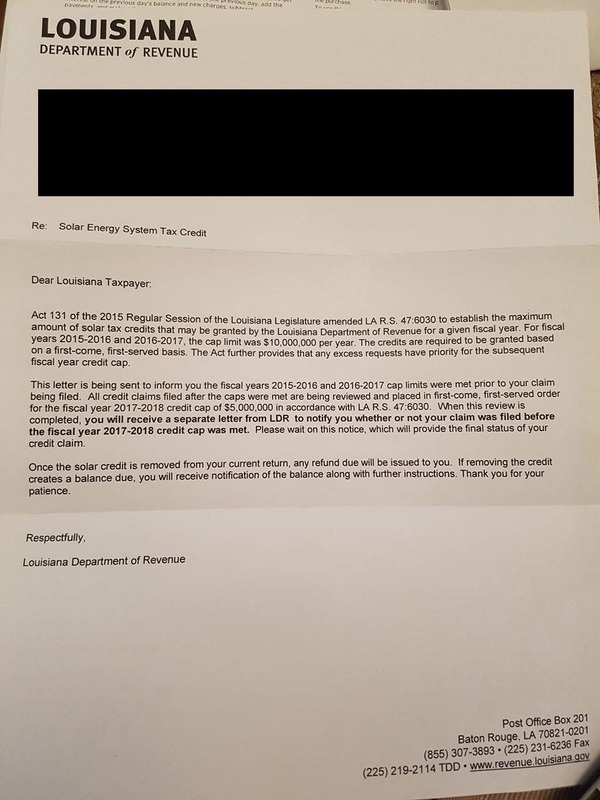 This is an update on my personal solar tax credit situation, my #SolarNightmare. On Monday (7/25), I checked the LDR website to see if the status of my refund had changed. For many, many weeks now it had remained in a state of perpetual processing, but on Monday it was different. The site informed me that my return amount had been adjusted and I should receive payment by the end of the week. I took this as confirmation the State had finally and officially informed me that it was preparing to bone me. Just to see if at least my income taxes would be refunded, I checked my bank account on Tuesday and found the entire solar credit waiting for me. I’ve yet to receive any other official correspondence. I don’t know why or how. I personally know someone who filed their taxes within an hour of filing mine and used the same solar installer to do it, but this person’s credit was deferred. This person also submitted the tax forms online via the LDR site, whereas I tried and failed to submit mine through TurboTax and had to fax the whole thing in a couple of days later. Regardless, I’m in the clear as far as my financial burden goes. I paid off the bill immediately. If it doesn’t close itself automatically, I’m going to call and have the creditor close the account. Some people have described what happened to me as a blessing, but I disagree. I was lucky. Other people won’t be. What the State did was wrong. Almost everyone who comes to understand the situation will agree, so we can’t let the State get away with this. The best way to fight it is to make know what it did. Expose it by talking about, telling others about, and forcing the local media, especially the Baton Rouge media, to do it’s job. Below are links to three stories/videos from local media that actually get into retroactive aspect of the law and what it means for unfortunate homeowners. Most other media outfits just recycle that incomplete AP story. The first one is the Times Picayune story. It only mentions the law being retroactive at like the 10th paragraph down, but it has 53 comments now. It needs MORE. There is also now a Facebook group set up specifically for this issue. I suggest joining it. 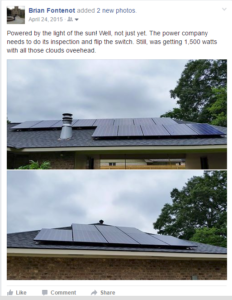 One of the big solar installers, Joule, sent out an email to its customers with some helpful advice and suggestions as to what can be done to survive the sudden acquisition of a $12,500 of debt. Keep in mind this email is intended for Joule’s customers only, but it contains a lot of useful contact information. I also want to remind people that the Federal Government is supposed to pick up 30% of the cost of your system. So, depending on how you choose to manage the debt, it may be wise to apply that Federal money to the debt, first. I am no financial adviser, however. This is just a mere observation. 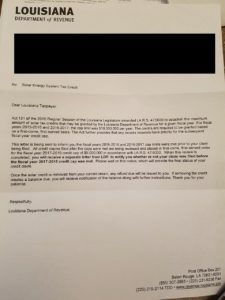 Per the recent announcement from the Louisiana Department of Revenue (LDR), which can be read here, the state has received $39 million worth of solar tax credit claims. The total solar tax credit funding available is $25 million. For folks like you who had their systems installed in 2015, your tax credit eligibility and the timing of any tax credit disbursement is based on the date you correctly filed your solar tax credit claim and it was received by the LDR. Any solar panel systems installed this year (2016) or later will not be eligible to receive a tax credit from the state. Joule has made repeated efforts to have the current solar legislation changed in favor of our clients. We have met with dozens of legislators and spent tens of thousands of dollars on professional lobbyists in an attempt to improve the situation on our clients’ behalf, but the state has ignored those requests and has chosen to retain the current structure. Several of our clients have already notified us that they have been issued their solar tax credit. Over this week and next, all other filers should be receiving a notification in the mail as to whether their solar tax credit claim has been approved, deferred until a future year, or denied. If you chose to use GreenSky financing to pay for your solar panel system, we believe that it is likely that your financing promotional period will expire in the near future. As we understand it, when this promotional period ends, you will be charged a high interest rate (17% or higher) and will begin owing monthly payments on your loan. Not knowing your personal financial situation, we at Joule cannot advise you about what action, if any at all, you should take with respect to your GreenSky financing when the promotional period ends. However, we have some information that you may find helpful in making the decisions with respect to this financing that are right for you. First, we want to provide you contact information for GreenSky in case you have any questions or need additional information about your GreenSky loan. GreenSky’s customer service number is (866) 936-0602, and its website is http://www.greenskycredit.com. Any inquiries or information requests you have about your loan should be directed to GreenSky. We also want to make you aware of a New Orleans-based financing entity, ASI Federal Credit Union, that has offered to receive and review loan applications for solar customers affected by the state’s solar tax credit program. You can reach ASI by phone at (504) 733-7274, option 3, or on its website at www.asifcu.org. We understand that, if you decide that refinancing your GreenSky loan is the right choice, ASI will work with you to determine what financing terms, if any, are available to you. Joule is providing you information about ASI solely to help you explore your options – we will not receive any kind of benefit if you elect to refinance your loan with ASI. Any decision to work with this or any other financing company or apply for any of their financing products is entirely your decision and responsibility. Joule does not endorse, nor is affiliated with, ASI nor any specific financing company or their products. There are also many other avenues that you may wish to explore to help you figure out the best option regarding your GreenSky loan for your financial situation. The internet can be a great resource for locating useful information about available financing options. One website focused on personal finance that you could review is www.nerdwallet.com, but there are many others like it that can provide helpful information. Please note that Joule is not a financial advisory firm. Other than encouraging you to review your options with respect to your GreenSky loan before the promotional period ends, we cannot give you any advice on payment plans, refinancing requests, loan deferments or otherwise how you should handle your GreenSky loan. Further, we do not recommend any particular option or company over another. Finally, please note that Joule has no ability to control or otherwise influence the decisions that GreenSky, ASI or any other financial institution or other entity may make with respect to your GreenSky loan or the refinancing of such loan. I hope this helps someone. I’ve been on a tirade on Twitter lately over the issue, using the #SolarNightmare hashtag. I suggest those of you fighting to have this law fixed also take to Twitter and use it to spread the word. Send a tweet to @LouisianaGov about your situation.